Injured in an Accident Due to Another Person’s Negligence? Being injured in an accident due to someone else’s negligence is one of the most disruptive and stressful events that can occur in a person’s life. After such an accident, you are likely not able to work, resulting in lost wages, and — if you have children — trying to find childcare when you are recuperating from an injury only adds to the stress. Further, the ever-growing pile of medical bills only makes the situation seem more frustrating and hopeless. Take heart in knowing, however, that all is not lost; there are people who will fight for you on your behalf. 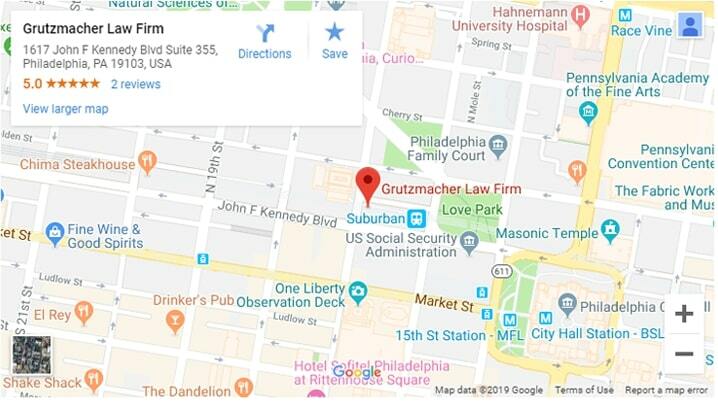 Local Philadelphia personal injury lawyer, Adam E. Grutzmacher, has made a career out of helping victims who have been wrongfully injured due to another’s negligence. Civil justice is the foundation of his personal injury law firm. Therefore, he does everything in his power to ensure that each client that comes under his care receives theirs. He has experience in various circumstances of personal injury and can utilize this knowledge to secure a favorable ruling for his clients. According to the National Safety Council, “an American is accidentally injured and killed every three minutes by a preventable event”. These numbers consistently increase annually. Over 14,000 more people were injured or killed in otherwise preventable accidents between 2015 – 2016 alone. If you have suffered an injury in any of following instances, then Philadelphia personal injury lawyer, Adam, can help. Our personal injury law firm also represents individuals who were struck and subsequently injured by any kind of motor vehicle as a pedestrian. A premises liability claim can be filed if a person was injured on someone else’s property due to negligence. For example, say a patron falls on a wet floor that did not have a warning sign up. If an injury results, then the accident could be attributed to negligent business practices. Premises liability claims usually involve slip and fall accidents and equipment failure (like escalators and elevators) which result in a patron’s broken limbs or other serious injury. However, premises liability can also involve animal attacks — such as dog bites — as owner negligence is often to blame for these incidents. In these cases, a personal injury claim can be filed directly against the owner of the animal. Were you injured in an accident at a worksite due a business owner’s negligence? Our construction accident lawyer can help. Additionally, we have extensive experience representing personal injury and wrongful death claims on behalf of passersby and other victims of construction accidents. The top reason for filing a medical malpractice claim is most often attributed to “failure to diagnose or a delay of diagnosis”. If you have been the victim of any kind of medical malpractice, then our attorney can fight on your behalf for rightful compensation. If you have suffered an injury due to another person’s negligence, you are likely overwhelmed with not being able to work — losing wages as a result of missed work — or otherwise carry on with your normal day-to-day life. Adam Grutzmacher, the founder our local Philadelphia personal injury law firm, has dedicated his entire career to helping victims who have been wrongfully injured due to another’s negligence. As a result of his experience, he understands what an intimidating and overwhelming experience it can be; he has seen it firsthand. Finding legal representation should not add to the stress. For this reason, we offer free consultations. You can sit down with our attorney in person and discuss the details of your specific case, free of charge. We hope that you will leave with more confidence about your situation… and your future. Contact our office today to schedule your complimentary consultation. Take the first step to getting your life back — we can take it from there.